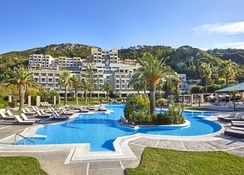 Sheraton Rhodes Resort is a fantastic hotel to stay for spending your holidays in Greece. The rooms in the hotel have contemporary furnishings and boast spectacular views of the gardens and the sea. There are plenty of dining facilities too in the hotel, which will make your stay a delicious affair. Get yourself pampered in the spa with a range of beauty treatments and massages from head to toe under the hands of expert masseurs. Other than this, there is a fully-fledged fitness center, where you will find high-tech equipment’s. The best thing to describe in the hotel is the lovely swimming pool, where you can soak up the Greece sun while taking a refreshing swim. Sheraton Rhodes Resort is strategically positioned in Ialyssos Avenue, Greece. It is close to numerous attractions, sports clubs, bars and restaurants. The Rhodes International Airport is 10.4km from the resort. The rooms in the hotel are comfortable, airy and provide magnificent views of the gardens and the sea. They are available in numerous categories to accommodate singles, couples, families with children and groups of friends. Some of the common facilities in the room include flat screen TV, air conditioner, double bed or single bed and much more. There are plentiful dining and drinking options within the hotel that include buffet breakfast, complimentary, continental breakfast (complimentary), full American breakfast (complimentary), grab-n-go breakfast (complimentary), hot breakfast, (complimentary). If you want to explore more, step into restaurants and bars outside the hotel. The hotel features a massive outdoor heated swimming pool, where guests can take a refreshing swim. The fitness center of the hotel is fully equipped with gym facilities and a personal trainer throughout the week to assist guests. If you want to spend a relaxing time, visit the spa and wellness center, where beauty treatments, massages and therapies are offered. Sports lovers can hit the on-site sports court. Kids too can have a lot of fun in the kid’s club under the supervision of the hotel’s staff members. We stayed in Sheraton Rhodes in August 2018, nice hotel, friendly staff & clean room. Food is nice to but not much entertainment mainly in the evening & for kids at all. I would not recommend this hotel to anyone with young family. We were there with our two kids was disappointed as nothing to do in the evening.